Gourmet E-Liquid of the Week! Take a minute to check out the next big thing to come from Wismec, you’ll be glad you did! Following the Sinuous is the Sinuous Ravage 230W kit with the Gnome Evo Sub-Ohm tank! This sleek mod features a 1.45 inch color screen display like you’ve never seen! Powered by dual 18650’s, this mod reaches 230W and also has a full temperature control option! The Ravage has a squeeze fire button, three control buttons, and two adjustment buttons. On top of a centered 510 connection is the Gnome Evo tank! This 25mm tank has a child resistant, slide top fill system for your convenience! It comes with 2 -0.4 WMO1 coils and various sized drip tips! 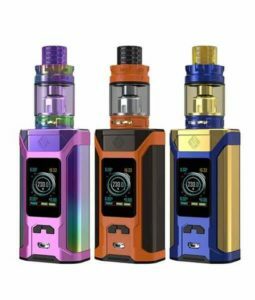 This unique kit is not only light and sleek , it is powerful and will surely provide everything you are looking for in a vape! To purchase the Wismec Sinuous Ravage 230W and Gnome King Sub-Ohm Starter Kit, CLICK HERE! 22 South Water Street,Frostburg MD, 21532. © Copyright 2019 The Vapor Room ®, Sky Vapors LLC All Rights Reserved.